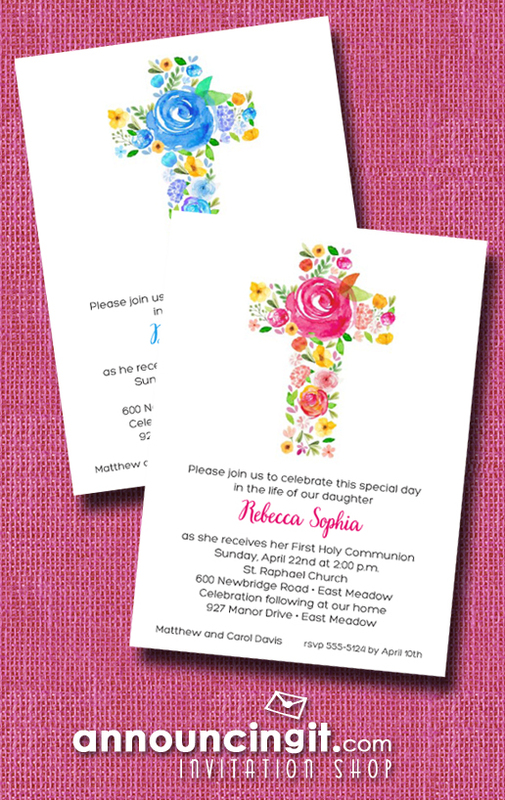 The perfect way to ensure a fabulous turnout at your child’s first communion, baptism or christening is to mail beautiful invitations that show your event is one not to be missed. You can use any of our invitations for any occasion, just change the wording to fit your special event. Most of our religious invitations also have matching thank you notes and come in colors for boys and girls. 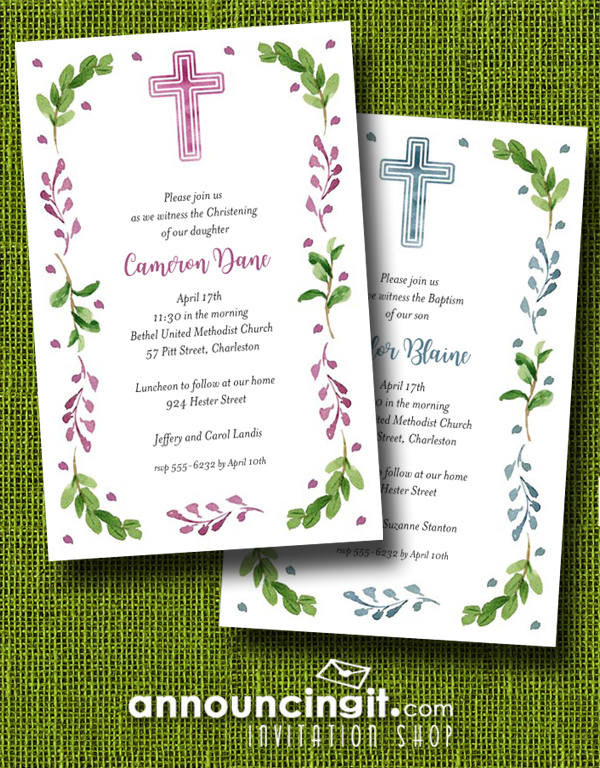 A beautiful cross of watercolor flowers in shades of pink or blue with yellow flowers and green leaves and branches, these invitations are perfect for your child’s first holy communion celebration, dedication or baptism celebration, just change the wording for your occasion. Your baby’s baptism or christening is a very special occasion and calls for memorable invitations. Beautiful watercolor wreath of spring leaves and flower buds in shades of blue or pink, these invitations are perfect for your baby’s baptism invitations, christening invitations, dedication or other religious celebration, just change the wording to fit your occasion. Our First Holy Communion Invitations are printed on shimmery paper in the color of your choice and they come with coordinating shimmery white envelopes. These invitations are perfect for your child’s first holy communion invitations. 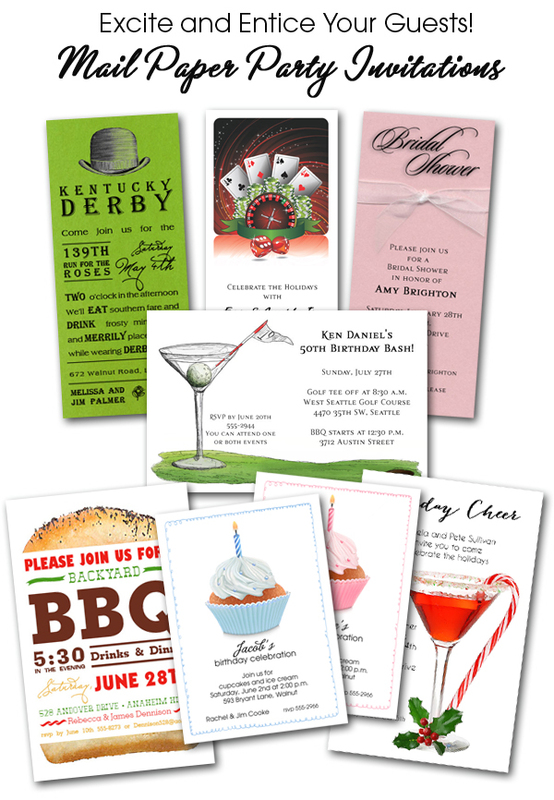 Mailing your guests paper party invitations sets the tone for your party and creates buzz around your bash. But, are paper invitations really necessary? My sister got into a discussion with her hairstylist about paper invitations versus electronic and the stylist described how technology was changing and she had just received a cute emailed invitation that flying birds and how cute it was. Is this a last minute party? Am I a last minute guest? They couldn’t afford paper and stamps? Yes, for a last minute cocktail party, I’ll text my friends or call them, but I just don’t trust something as important as their attendance is to my affair to their email inboxes. Call me old school, but there is just something fabulous about the feeling you get when you open the mailbox and there’s something in there besides bills and ads. Your invitation is the first impression people have of your party. They can’t see the amazing food on your menu, the incredible way your house is decorated or how much fun it’s going to be. A laundry list of facts printed on a piece of copy paper and folded into an envelope that looks like a bill, is not going to make it to the top of the pile when it comes to scheduling upcoming events on your guests’ calendars. You can’t post an electronic invite to your fridge. Well, I guess you could print out some of them, but you’ll lose the flying birds and a lot of its appeal when you try to get it to print on copy paper. We understand that cost can seem like an issue when you compare it to doing-it-yourself or free emailed invitations, but you only get one shot to make a first impression. If your invitation doesn’t make the grade, having a bad turnout for your party can be depressing as well as expensive in wasted food, drinks and time. For the do-it-yourselfers, we do sell some of our invitations blank so you can print them yourself. If you’re not familiar with how to typeset an invitation or how to print on anything but 8-1/2″ x 11″ paper, we suggest you skip the hassle and the learning curve and let us print them for you. We’ve been printing invitations for over 20 years, we have the cool fonts you would have to search the internet for and if you screw up when printing, you’ll have to buy more invitation paper. We suggest you skip the stress of DIY and use your time for the million other things you will need to do for a successful party. And, of course, for the best party turnout, go old school and mail party invitations that will excite and entice your invited guests to attend your event. Your child’s first communion is a blessed event in your life and one to be cherished. Most families have some sort of party or get together after the ceremony to celebrate. 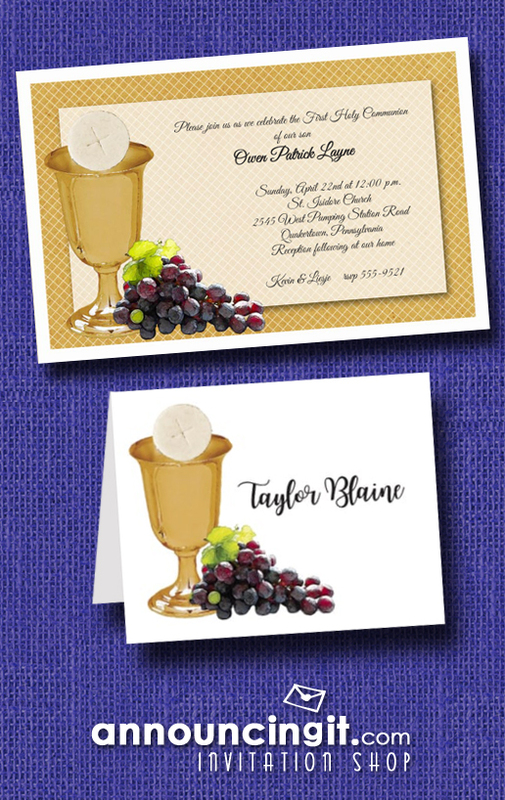 Chalice, Bread & Grapes Girl’s Religious Invitations are a perfect choice for your daughter’s baptism or first holy communion invitations. A gold chalice, purple grapes and a loaf of bread are highlighted by a pink pinstripe border. 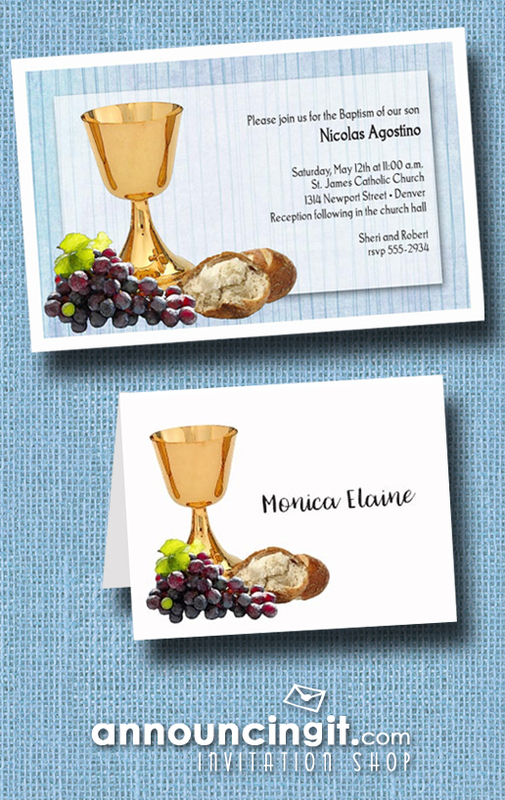 Chalice, Bread & Grapes Boy’s Invitations are a perfect choice for your son’s baptism or first holy communion invitations. A gold chalice, purple grapes and a loaf of bread are highlighted by a blue pinstripe border. Matching thank you notes are also available to thank guests for their gift or for coming to celebrate with you. 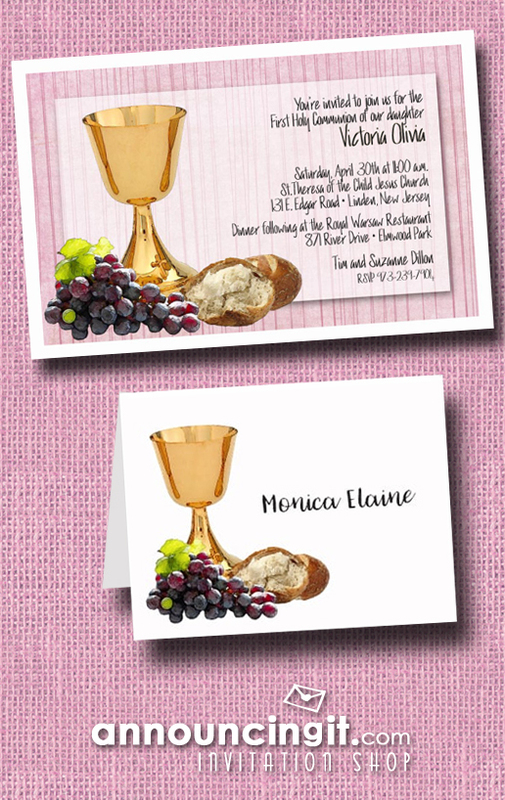 Chalice, Bread & Grapes Religious Invitations are a perfect choice for your child’s first holy communion invitations. A gold chalice, purple grapes and a loaf of bread are highlighted by a beige pinstripe border. 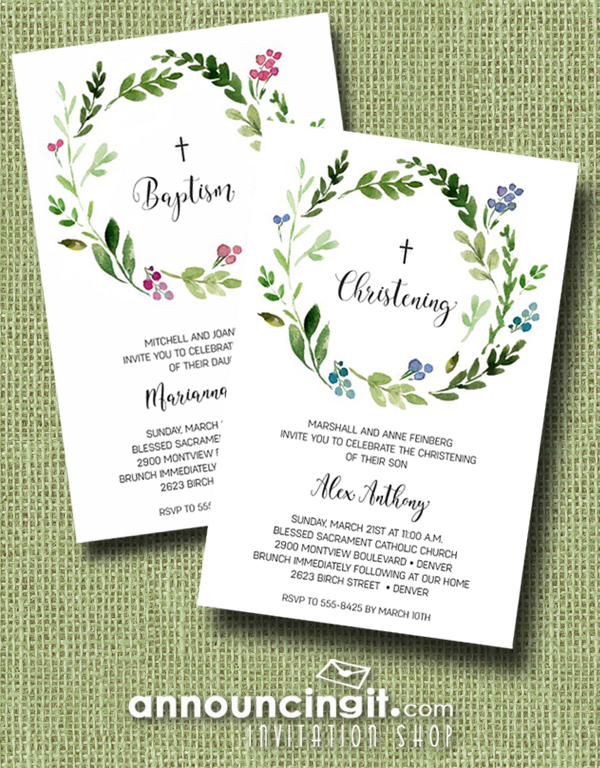 If you are planning your child’s First Communion soon, you will want to put ordering First Holy Communion invitations at the top of your list of things to do. First Communion invitations set the tone for your celebration and creating personalized printed invitations shows your occasion is important to you. 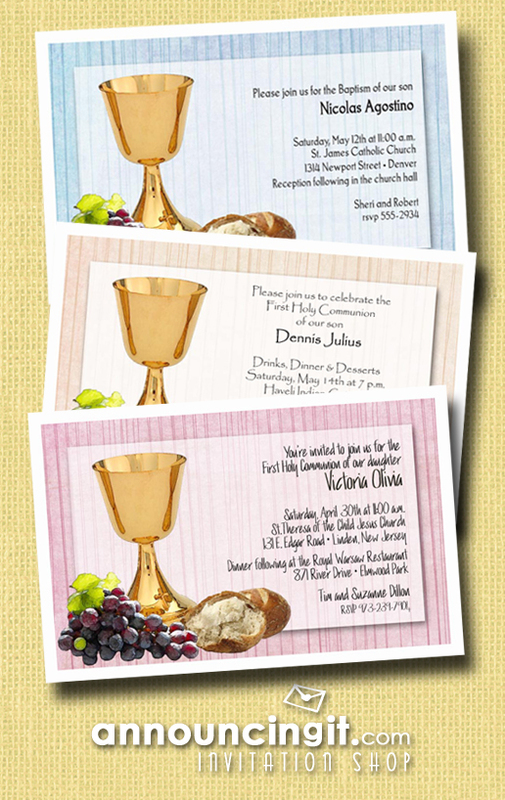 The Chalice & Wafer on Gold First Communion Invitations are perfect for your celebration.